An emotional Peterborough Panthers promoter Ged Rathbone admits two seasons in charge of the city club have left him drained. Rathbone broke down in tears when attempting to address supporters immediately after Panthers beat Rye House 46-43 in their final home meeting of the season last night (September 12). 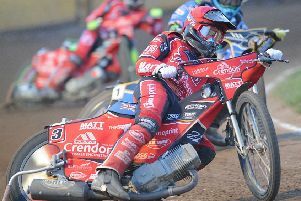 The success at the East of England Showground kept their Premier League play-off hopes alive but Rathbone, who rescued the club from potential oblivion in late 2014, insists he will shoulder the blame for a difficult 2016 campaign if Panthers fail to make the top six. And the Middlesbrough-based businessman refused to be drawn on his long-term future after admitting running the club has turned into a seven-day-a-week slog for himself and partner, Lisa Fleming. Rathbone said: “I have to take the blame for the way the season has gone. I make decisions with the help of my management staff so I take responsibility for things not going to plan. “It is only my second season as a promoter and I will live and learn from any mistakes I’ve made. “Other than letting Michael Palm Toft go, I still think we got pretty much every other move right. In fact we probably stood by some riders for too long. “It has been very tough in these last few weeks as I’ve come in for a lot of personal abuse from certain people, but I will always stand by the decisions I make. “I absolutely love this club and that is why I got a bit emotional last night after the meeting, but the last two seasons have taken their toll and I’ll be giving the future plenty of thought over the next few weeks. “I’ve got to seriously think about the amount of time, effort and money that has to go into running the club. “I have a near 400-mile round-trip for every home meeting, I don’t get home until 2.30am typically, and I’ve done more than 75,000 miles in two seasons of speedway. “Myself and Lisa have put a mammoth amount of work in to the club. It’s almost a seven-day-a-week business for us all year round, and we need a life away from the sport as well. “I’m not saying it is the end of Peterborough Speedway, or anything like that, but I have to make sure it is right for me. “There are also a lot of things going on in the sport which are frustrating, and I also have to take things like that into account. One such frustrating episode is Panthers’ battle to arrange their one remaining fixture of the 2016 season – away to Edinburgh – ahead of next Monday’s (September 19) cut-off date for results to count towards the play-offs. Rathbone added: “We’ve offered to go there tonight (Tuesday), tomorrow (Wednesday), Thursday and on Monday next week, but they don’t seem keen on any of those dates. “We’ve said all along that we can’t race on Friday, or at the weekend, as Kenneth Bjerre is unavailable due to a big meeting in the Czech Republic. “I blew a fortune running our final home meeting on a Monday night because we knew how important it was to get it in.